3. What’s it like to use? The Google Pixel is an excellent flagship phone that's only let down by mediocre battery life and some last-gen specs. 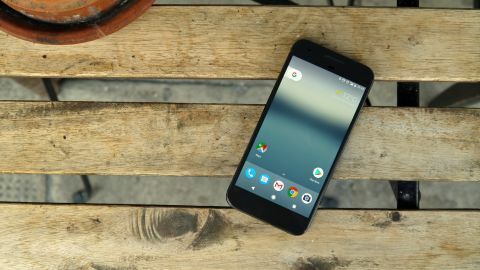 The price has recently dropped, making the Pixel is a breath of fresh Google air in a world of Android over-complication. Nexus is dead. Pixel is king. Say hello to the Google Pixel, a handset ushering in a new era of the search giant's smartphone range. It arrives alongside the larger (and even more expensive) Google Pixel XL, as the firm doubles up on devices for another year. The Pixel takes over from 2015's Nexus 5X as the smaller offering in Google's lineup. The thing is though, it hasn't inherited its predecessor's price point, with the new Pixel sporting a decidedly more premium tag. Update: Google has delisted the Google Pixel from its online store, thus officially dropping the curtain on the first-gen phone. It's still possible to find at several retailers, but it could become difficult (and more expensive) to find if you're after a cheaper Google phone. The price gap between Google's first-gen device and the new Google Pixel 2, so far, hasn't been that wide. Thus, purchasing the former over the latter simply couldn't be recommended. But as time goes by, the decision will become easier. Why? Well, the prices are getting better for the Pixel – as low as $399 for the 128GB version. This is almost half-off its original price. While price varies for the original Pixel, you won't see as much fluidity just yet for the Google Pixel 2. It released in October 2017, so expect to wait another handful of months before big deals show up. The Pixel comes in two variants, 32GB and 128GB, with the smaller storage option costing you a lofty $649 (£599, AU$1,079) at launch. Meanwhile the Google Pixel price for the 128GB model is a staggering $749 (£699, AU$1,229) at launch, pitching it against the likes of the iPhone 7, Huawei P9, HTC 10 and Samsung Galaxy S7. However, the price through the Google Store has now dropped to $549 and $649 for the 32GB and 128GB models respectively in the US. Meanwhile, in the UK it's EE who's bagged the exclusive Pixel deal with £9.99 upfront and £50.99 per month giving you 10GB of data plus unlimited calls and texts. If you've owned a Google-brand smartphone in the past you'll appreciate the no-nonsense stock Google interface – and you'll be glad to know it's business as usual on the Pixel when it comes to the Android Nougat operating system. For those who are new to Google's handsets, things may be less clear. While HTC is the firm that has actually built the device, the search giant has made all the calls on what goes into the Pixel, and how it operates. These handsets are aimed to showcase the best of Google and Android. They pack new features not seen before on the platform (Google Assistant and a ‘best-in-class’ camera in the Pixel's case), and you'll be first in line for an update when a new version of Android is launched – usually weeks, if not months ahead of the likes of Samsung, LG, Sony and co. The Google Pixel sports a first for Google's smaller smartphone – a full glass and metal body – along with a 5-inch full HD display, Snapdragon 821 processor, 4GB of RAM, 12MP rear camera, fingerprint scanner and 8MP front snapper. On paper at least, then, the Google Pixel looks to be a flagship contender – but can it live up to the hype – and that price tag – in real life? At the beating heart of the new Pixel smartphone is Google Assistant, which the search giant claims gives you a 'personal Google', accessible whenever, wherever. Google is driving the Assistant angle hard, and is keen for it to not only be the center of your phone, but the center of your life. It debuted on the Pixel, but we've been seeing it on other devices, including the LG G6 and Samsung Galaxy S8. How does Google Assistant compare to your former pocket mates? Assistant is essentially an upgraded Google Now, with better conversational smarts – ask ‘what’s the time in LA?’ and then follow up with ‘what about San Francisco?’ and it’ll know you want the time in that location – and a fleet of new tricks including jokes, poems, facts, games and even funny videos. As well as the fun stuff you can ask Assistant to do a host of more useful things such as make a list, send a text or check your agenda – which is helpful, but not that much quicker than jumping into the corresponding app itself. You can use your voice to trigger Assistant at any point by saying 'OK Google' – and this works even when your phone is locked. Sometimes it can take the Pixel a few attempts to pick up your voice, and we found it struggled in noisy environments, and even at home with some music playing. If you have to say the 'OK Google' command more than once the Assistant instantly becomes frustrating. Luckily, you're able to now type to Google Assistant as of Google IO 2017. Asking ‘what can you do’ is a good way to find out how else Assistant can help you, from finding out how the Packers got on last night (they lost, bad times) to diving into a Geography quiz which highlighted the gaps in our flags knowledge. Generally, Assistant was able to comprehend our garbled commands, but there were several occasions when it got things wrong, or didn’t register our dulcet tones. It still feels a bit strange talking to your phone – and when you’re made to repeat yourself the novelty starts to wear thin pretty quickly. There’s no doubting that Assistant has the potential to be a powerful tool; with the same smarts built into Google Home and support for the likes of Chromecast, and your smart lighting and heating systems, we're getting closer to the day when you can pretty much run your home with your voice. Assistant also learns as you go, and the more you use it the smarter it will get – but that takes time, and patience, and you may find it’s easier to just use your fingers. We’re still a little way off fully realizing the potential, and for now Assistant is a nice addition to the Pixel, but it’s not a feature many will be holding up as the stand-out reason to buy the phone.